Can your PCs make it through the forest on the way to their final destination? Will they be ensnared in the mystery of the dreaded ghoul wolves, or become entangled in a battle between druids and insects that is slowly destroying a small logging village? Are your PCs strong enough to enter the Canyons of Arcuri? Perhaps, they are even bold enough to enter the private, forested demiplane of the mad druid Niavark. This book contains forest-based adventures for several levels of play that are generic enough for any setting. 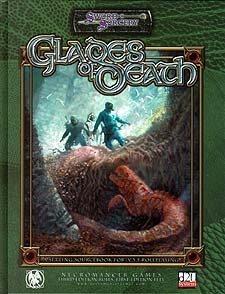 Glades of Death contains new spells, new feats, and a new look at skills and how to use them in the wilderness. Table and suggestions for the rapid creation of new fantasy forsts are also provided along with new monsters to surprise PCs. The four new forest-based adventures within provide opportunities to use the new feats and spells while challenging PCs, and players, to regard a trip thorugh the forest with fear, rather than simply a step toward a new dungeon, castle, or city. Requires the use of the Dungeons and Dragons Player's Handbook. This product utilizes update material from the v.3.5 revision.